More than 1,540 in-person attendees this month at the 5th annual Medellin Bird Festival (Festival de las Aves Medellin 2018) October 3-6 got a bird’s-eye view of how companies, governments and non-governmental organizations (NGOs) here are trying to find creative ways to balance environmental and economic conflicts. The growing, annual Medellin Bird Festivals – increasingly covered by local, national and international media -- are organized by Sociedad Antioqueña de Ornitologia (SAO) and co-sponsored by the city of Medellin, the Antioquia departmental government and more than 20 private companies and organizations, including the environmentally responsible miner Continental Gold, national electric-grid operator ISA, EAFIT University, Parque Explora, Area Metropolitana del Valle de Aburra and Medellin Herald. Perhaps no better example of efforts to reconcile environmental and economic conflicts was revealed in a lecture here on a just-concluded, three-year project to study, document, save and relocate threatened birds (and other wildlife) displaced by the gigantic “Hidroituango” hydroelectric dam project in Antioquia. That hydroelectric dam -- when finally completed around 2021 -- is expected to supply more than 17% of the entire electricity demand in Colombia, providing zero-emissions power to millions of people, homes, buildings -- and a future surge of environmentally friendly electric vehicles. Hidroituango also is seen crucial to economic futures, as the city of Medellin taps locally based, multinational power giant EPM for an astonishing 25% of its entire annual budget funding. The Hidroituango environmental studies also ultimately led to the publication of a new book, “Aves del Cañón del Río Cauca” (Birds of the Cauca River Canyon), unveiled here by University of Antioquia and sponsored by EPM, the company building the gigantic Hidroituango power dam. Among the threatened bird species in the canyon – upstream of the hydroelectric dam -- is the spectacular (and rare) Military Macaw (Ara Militaris), individuals of which have been nesting in cliffside rock cavities soon to be inundated by the rising Cauca River. As EPM and University of Antioquia researchers explained here, wildlife-rescue experts in recent months have helped to remove and relocate some 40 macaw chicks from various nests – along with capturing and relocating some 2,000 other threatened birds in the area. EPM meanwhile bought an 800-hectare property in nearby Buritica dedicated for wild-bird relocations, and also built a specialized tree-nursery project in the town of Ituango, which will provide crucial plants to help restore lost habitats. As EPM noted in a post-Festival press release, “the Cauca River canyon in Antioquia is a marvelous place that hosts a variety of environments including tropical dry forest and humid, pre-montane forests, which provide homes to many species, including more than 300 bird species. 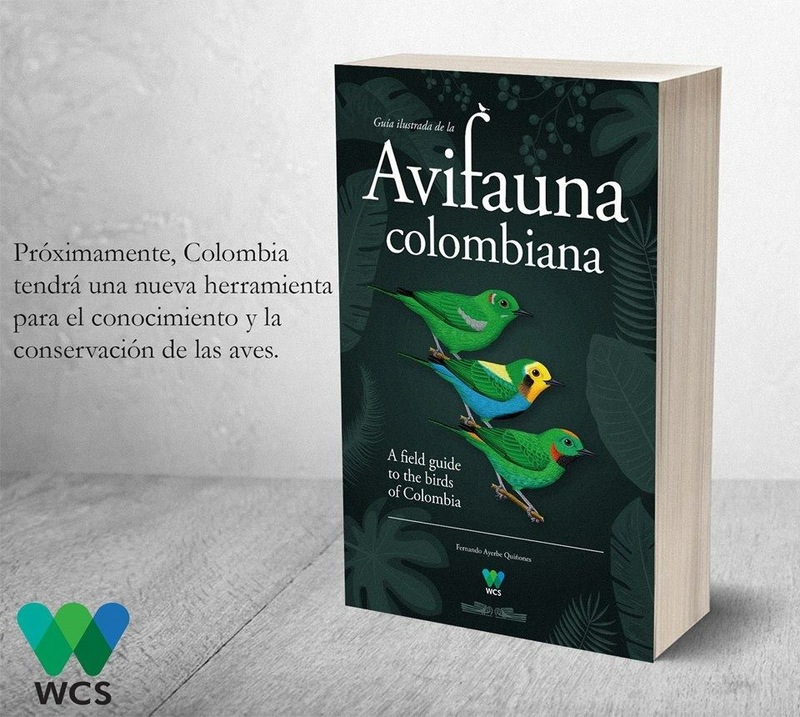 “This [Aves del Cañón del Río Cauca] book, in addition to other environmental studies and projects undertaken in conjunction with the Hidroituango project, shows the responsibility that EPM assumes in social and environmental management,” the company added. On a related front, Medellin’s Infrastructure Planning Secretary Silvia Gómez García explained here how the city has just transformed more than 30 heavily trafficked and building-congested areas into “green corridors” in recent months, in a COP$45 billion (US$14 million) project involving the planting of hundreds of trees, bushes and flowers. Probably the most dramatic example of this is the conversion of the cement “pyramids” formerly bisecting the downtown Avenida Oriental corridor into a spectacular array of tropical flowers, trees and bushes, attracting butterflies and other wildlife, she noted. Such projects not only improve wildlife habitat but also help to provide a heat sink to cement deserts that unfortunately have over-run Medellin – the “City of Eternal Spring” --over the past 50 years. Assuming that future Mayors continue this “green corridor” initiative launched by current Mayor Federico Gutierrez, then it’s possible to envision future “green” connections between Medellin’s main green parks (Cerro Nutibara, Cerro El Volador, Parques del Rio, Parque Arvi) to the green mountains east and west of Medellin and adjacent cities in Valle de Aburra, Gomez noted. Likewise, Medellin metro council of governments (Area Metropolitano del Valle de Aburra, AMVA) subdirector Maria del Pilar Restrepo noted in a presentation here that adjacent municipalities are taking similar steps to improve green spaces for birds and wildlife, including a regional project that is part-way toward the goal of planting and maintaining more than 1 million new trees. Other outstanding presentations here included workshops on the “Merlin” cell-phone bird-identification application by Cornell Laboratory of Ornithology researchers Drew Weber and Karen Purcell; a progress update on Medellin’s outstanding “Alto de San Miguel” nature reserve in neighboring Caldas municipality; and an update on the just-launched, second-edition “Guia Fotografica de Las Aves del Valle de Aburra” (Photographic Guide to the Birds of the Aburra Valley) published by AMVA and Parque Arvi, in cooperation with Sociedad Antioqueña de Ornitologia.